With only a few days left until my Consecration to Jesus through Mary, I wanted to post another little update. 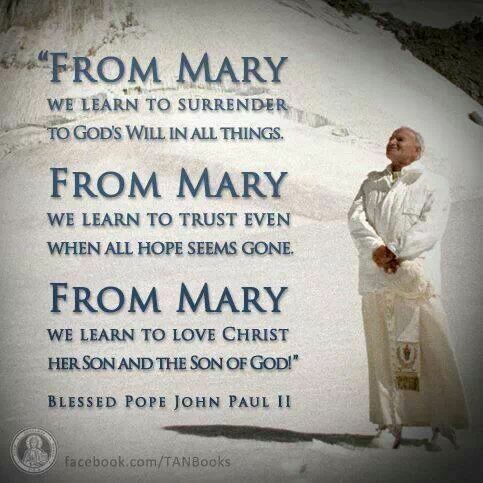 This past week I read about Mary through Pope St. John Paul II. The week before this I read about Mary through St. Teresa of Calcutta's eyes. Both of these saints are Marian powerhouses and helped me to see Mary clearer. I want to start with my week with St. Teresa of Calcutta. To be honest, I didn't realize she lived with such darkness surrounding her. She was a beacon of hope and light, I assumed she was filled with it herself. It makes me scared to take on such suffering. I fear I would buckle under the darkness. Suffering allows us to grow closer to Jesus because we must cling to Him. We share our pain and in that way, we share in His pain, perhaps being there for Him and keeping his heart company for a little while. One of the themes for St. Teresa was Jesus saying, "I thirst." What does Jesus personally thirst for in me? Obedience. Diligence. Zeal. Quiet prayer is difficult for me. I lose my thoughts, get distracted, and have a hard time being still without getting sleepy. Maybe one day it won't be so hard, but for now I get distracted from Jesus. I let my thoughts tell me Jesus doesn't even want me, because look at me! I am nothing. I am lazy. I can't even keep my mind on Him in prayer. But I have to work past that thought. I have to ask Mary to protect me and transform me. To share her virtues with me. And to purify my actions. With Mary by my side, I can give her my total dependence so that I am free to imitate her spirit in my daily life. With the practice of self-denial and intentional living, I can grow closer to her so that she may bring me to the foot of the cross. At the end of St. Teresa's week, I was left with her three big virtues on my mind: Total Surrender, Loving Trust, and Perfect Cheerfulness. In writing, it is easy to just be like a child. In practice, it is difficult and my kids love to help me work on it when I really don't want to. In Pope St. John Paul II's week, we went on a retreat within a retreat. We looked at Mary and how she became not just Jesus' mother, but a mother for us all. I learned that Mary held the virtues of obedience, faith, hope, and burning desire better than any of the apostles or saints to come. I have faith, and I don't doubt it. The burning desire is harder for me. I can be apathetic so often. And lazy. I need help igniting my fire, so I am putting that at Mary's feet so she may help me. I need to conquer my laziness and apathy in order to love more fully all the souls that Jesus wants to save. To do that, I must ask the Holy Spirit to remind me to ask for Mary's help. She will gladly help me, but I must ask first. Mary, from the beginning of her story, pondered in her heart. I have such difficulty with heart-pondering prayer. What does that mean and what does it look like? I get distracted. I don't remember what I am supposed to ponder. I feel like I lack a brain most of the time. In the wedding at Cana, what struck out to me whas Mary telling the servants, "Do whatever he tells you." Here she is a mediator, bringing our needs to Jesus. BUT in response, we have to do as he asks of us. I never thought of it that way. It is a two-way street and she is the light signal. How can I make my prayer life more personal and more meaningful? How can I offer up my daily crosses, especially when they make me feel so cranky? Can they even be a gift when I grumble about? Is my heart ready? Can I learn to love the way Jesus wants me to love? Can I bestow my love on others even when I am cranky?